Just when I started to make good progress in the main bath, both Olivia and I got sick. So these last two weeks haven’t been very productive. However, I’m back at it again and with the vanity repainted, the grout retouched, all that is left to do is add a few final details to finish off the look. I’ve been on the hunt for the perfect accent rug. Finding an area rug is the quickest way to cover any imperfections and add a little texture into the mix. 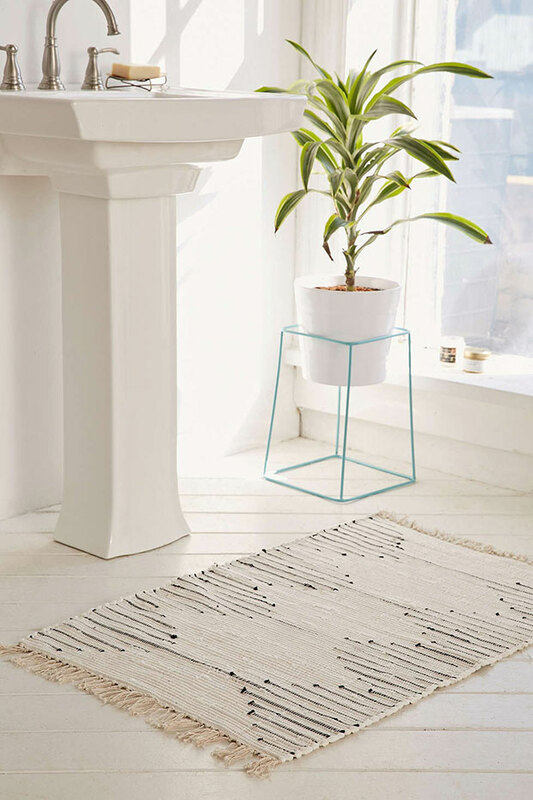 Instead of using the typical terry cloth bath mat, I’ve been searching for something with little more pattern and colour that will help accentuate my space. Here are my top picks that are not only comfy underfoot but will not break the bank! I love the accent rug pictured – so pretty! I love how rugs can change the entire look of a room! I love accent rugs. The geometric and Aztecy ones are my favorite. Oh I love the black and white rug!! Also that plant holder is fabulous!! Makes me wish I had windows in my bathrooms!! Loving that blue one I will have to go check it out. I am loving almost all of those. I actually need to rugs right now so I will be checking these out! Love these!! I’m a big fan of accent rugs. I have a HOT pink runner in my kitchen and then the most gorgeous blue accent rug in my living room. Oh those rugs are all really pretty! Rugs can be surprisingly expensive, at least bathroom rugs are smaller so they’re to quite as ridiculous. Where did you get the plant holder?? I LOVE that! !